THE BEST WAY TO PRESERVE, PROTECT, AND SHINE - ANY DAY OF THE WEEK. Our monthly plans give you the ease of automated monthly billing with no contract. You can cancel anytime by notifying us at least 5 days before your bill date. 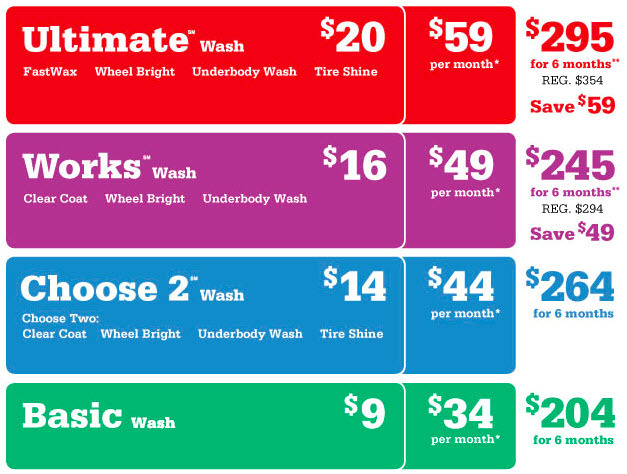 Our 6-month plans allow you to pay for your plan upfront and enjoy Unlimited washes for 180 days. Save on Ultimate and Works six-month plans: Buy 5 months, get the 6th month FREE when the first 5 months are prepaid. Enrolling is fast and easy: Visit any Mike's Location today! Due to our activation process, all Unlimited plans must be purchased at one of Mike's 24 locations. One vehicle per plan. A Barcode sticker must be adhered to windshield. Commercial rates apply if your primary business is transporting passengers. Monday - Friday from 8am - 5pm.